Plugin channels allow client mods and server plugins to communicate without cluttering up chat. This post by Dinnerbone is a good introduction and basic documentation. Allows the client or server to register for one or more custom channels, indicating that data should be sent on those channels if the receiving end supports it too. Payload is a null (0x00) separated list of strings. This channel was renamed from REGISTER in 1.13. Allows the client or server to unregister from one or more custom channels, indicating that the receiving end should stop sending data on those channels. Payload is a null-separated list of strings. This is only useful if plugins are disabled/unloaded while the client is connected. This channel was renamed from UNREGISTER in 1.13. Since 1.3, Minecraft itself uses several plugin channels to implement new features. These internal channels use the minecraft namespace. They are not formally registered using the register channel. The vanilla Minecraft server will send these packets regardless, and the vanilla client will accept them. Note that there were originally more channels included, but most of these were removed in 1.13. See this revision of the article for the original list. Announces the server and client implementation name right after a player has logged in. For the Notchian client and server server, this is "vanilla" (which is chosen using the Function net.minecraft.client.ClientBrandRetriever.getClientModName()) (encoded as a protocol string: a UTF-8 string with the length prefixed as a VarInt). These brands are used in crash reports and a few other locations; it's recommended that custom clients and servers use changed brands for the purpose of identification (for the Notchian client, the class used to get the brand is one of the few non-obfuscated classes). The brand is not processed in any other way, and Notchian clients will connect to servers with changed brands with no issue (the brand is not used to validate). The Notchian server sends a MC|Brand packet right after it sends a Join Game packet, and the Notchian client sends it right after receiving a Join Game packet. However, some modified clients and servers will not send this packet (or will take longer to send it than normal), so it is important to not crash if the brand has not been sent. Additionally, the brand may change at any time (for instance, if connected through a BungeeCord instance, you may switch from a server with one brand to a server with another brand without receiving a Join Game packet). Window ID Int The ID of the window that is open; this is an int rather than a byte. What appears to be the purpose of MC|DebugPath as seen in the snapshot 16w14a announcement. This is not found in the normal game. 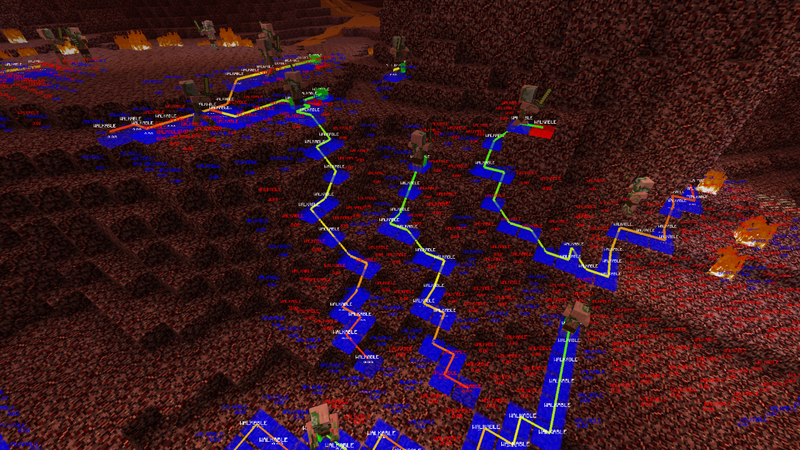 Never sent, but does something with pathfinding debugging. The client reads the data and stores it, but its renderer cannot be enabled without modifications. Unknown 1 Int Used as a key in the mapping that stores this data; might be an entity ID? Current path index Int Index in the points array that the entity is currently targeting. That point is rendered red; the others are rendered blue. Never sent, but used to debug block updates. Does not render without modifying the client. Time VarLong World timestamp at which the update occurred. 200 ticks after this timestamp, the given update stops rendering. Location Position Location of the block that updated. Never sent, but (presumably) used to debug caves. Does not render without modifying the client. Cave position Position Rendered as a white cube; also used to determine the color of the other parts. Never sent, but (presumably) used to debug structures. Does not render without modifying the client. Adds a single new structure, which will always be rendered if the player is in the same dimension. Dimension Int The dimension the structure is in. Flag Boolean If true, the sub-box is rendered in green, otherwise in blue. Never sent, but (presumably) used to debug something with world generation. Does not render without modifying the client. Adds a colored cube of the list of things to render. This cube is never removed. Location Position The center of the location to render. Size Float Diameter/side length of a cube to render. Red Float Red value to render, from 0.0 to 1.0. Green Float Green value to render, from 0.0 to 1.0. Blue Float Blue value to render, from 0.0 to 1.0. Alpha Float Alpha value to render, from 0.0 to 1.0. Sent after a Server list ping in Minecraft 1.6. More information on Server List Ping#1.6. In 1.7 and above, the Request (Status, 0x00, serverbound) packet is instead sent before the ping. Since this plugin channel is only sent for the legacy server list ping, it uses the older packet structure. Channels listed in this section are not used by the vanilla Minecraft client or server. This is just a likely-incomplete list of channels used by mods/plugins popular within the Minecraft community. Formerly BungeeCord; additionally, note that the channel name is remapped by spigot so that the old name can still be used in plugins. Used by ModLoader to support custom GUI windows. Does not use the REGISTER channel. Used by the server-side WorldEdit and the client-side WorldEditCUI to coordinate selections. Used by the client-side World Downloader mod to get permission information and perform permission requests.